This is set of 3 fonts that include letters that can be arranged to make a round monogram design or logo. The purchase includes a basic macro that can assemble the font as a monogram. The monogram is designed to consist of 3 letters but you can also get creative with 2 or more than 3. I have noticed a few round monogram fonts on the web and have designed this font not only to be unique and very different from all others you will ever see, but to also be a cool looking font. Install font, install macro. Use macro to assemble letters as a monogram, easy! Please note, I have spent a lot of time creating this as fonts are very time consuming to make. If you decide to purchase it please respect and use it only for yourself and do not share with others. Thanks, John. 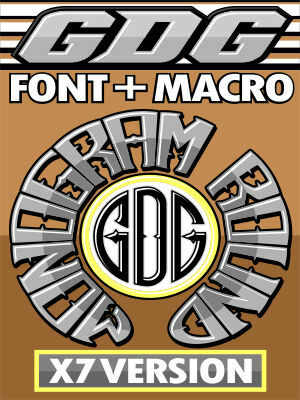 This font and macro licensed for purchaser and will only work in CorelDraw X7. This is the X7 version. Licensed only for CorelDraw X7.